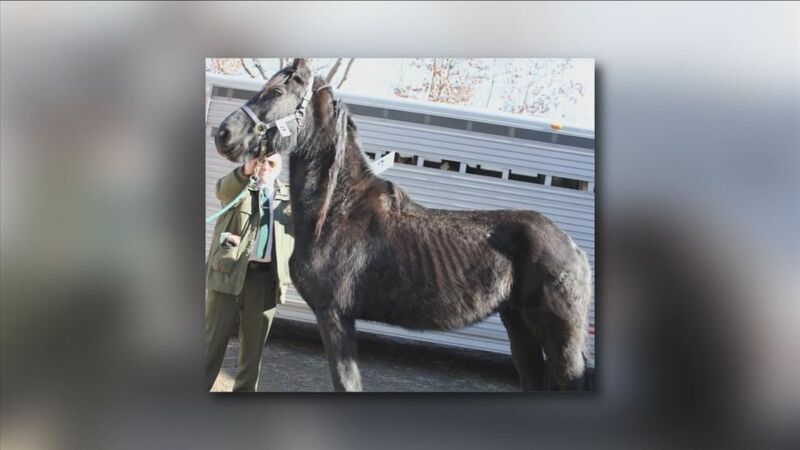 In the week since the state government seized 32 horses and dozens of small animals from Fairy Tale Equine East Hampton, the horses have been recovering at the large animal rehab facility at the prison in Niantic. "They're frankly in very rough shape but they're in great hands and feeling better," Rep. Melissa Ziobron, (R) East Haddam, said. "It was pretty sad this morning when I took a visit there." The investigation into conditions at Fairy Tale continues and the Department of Agriculture says the probe could lead to criminal charges. A picture of a young horse that did not survive its ordeal is on a GoFundMe fundraising website, to help pay for the cost of care for survivors. It's more than halfway to its goal of $20,000. "Isn't it amazing?" asked Ziobron. "We have been just overwhelmed, frankly. The support is all across the country. The horse community is actually a very close knit community and they're really stepping up." On the legislature's appropriations committee, she spent much of the day hearing government agencies try to protect their funding. She knows the state agriculture department handles short-term animal rehab. "But I knew as soon as we heard about this it was going to be a longer rehab for these horses and I felt very strongly that taxpayers shouldn't be the only ones who are looking at that," Ziobron said. The money raised on GoFundMe will go to the agriculture department animal abuse cost recovery account that's also open for donations.